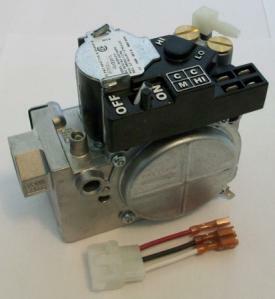 This page lists gas valves, oil valves and related parts from Honeywell, Robertshaw and White-Rodgers. We stock many of these valves. If not in stock, we can have them shipped immediately from our vendors directly to you. If you wish to narrow your search, you can search for your part number using the box in the upper-right corner of this page, or you can use the links below and on the left. 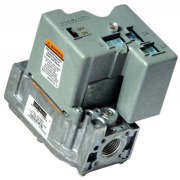 Honeywell (SV, V4, V8, VR, VS) - Honeywell valves have a part number format in the form of P(P)NNNNXnnnn. Where P or PP is the prefix denoting the type of valve: SV, V, VR or VS; NNNN is normally four numbers; X is a letter and nnnn are four more numbers. Sometimes the nnnn is not adjacent to the PPNNNNX characters, but found elsewhere. These last four digits are important, often denoting unique characteristics of the valve. 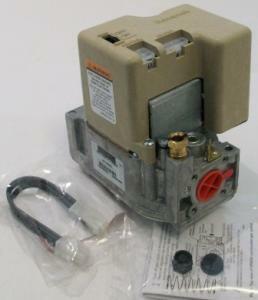 Honeywell makes some valves for specific manufacturers of equipment. These valves, called OEM (Original Equipment Manufacturer), may only be available from the manufacturer or their dealers. Robertshaw - Robertshaw valves are made under the Uni-Line label and have a part number format of NNN-nnn, where NNN is a three digit number denoting the sub-category of valve (700, 710, 720 ...) and nnn is a three digit number denoting the specific valve in the sub-category. White-Rodgers - Most of the White-Rodgers gas valves have the format of 36XNNN-nnn, where X is a letter, NNN is a three digit number and nnn is also a three digit number. The 36X denotes the series of valve and the NNN-nnn denotes the specific gas valve in the series. You can find cross-reference and other information on White-Rodgers (Emerson's) gas valve website. 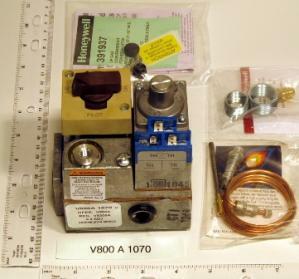 Part numbers beginning with "V"
Honeywell, Robertshaw and White-Rodgers make OEM parts and may obsolete parts and replace them with new part numbers. If you search for your Honeywell, Robertshaw or White-Rodgers number and do not get results, try searching for other numbers on the valve or call us with your equipment manufacturer's model and serial number. 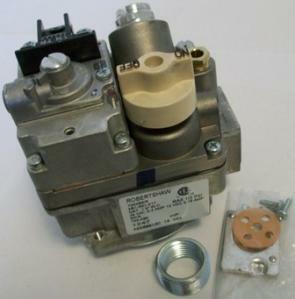 We stock OEM gas valves and other parts for American Standard/Trane, Armstrong, Burnham, Ducane, Goodman, Miller/Nordyne, Reznor, Rheem/Ruud, Weatherking and others.